Carol Rowling has just recently had an exhibition at ABD the gallery and is busy working on new works to take to Ferrara, Italy for an International art exhibition in late October. Carol sent work to Italy last year and and from that exhibition work was taken down to Vico del Garbano in February for San Valentino exhibition and won an award there. 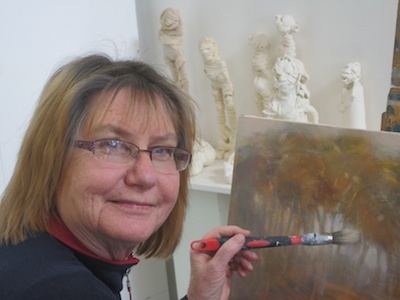 Lauren Wilhelm has taken a year off from the rigours of solo exhibitions but is still painting and exhibiting pieces at Margaret River Galleries and various small shows. 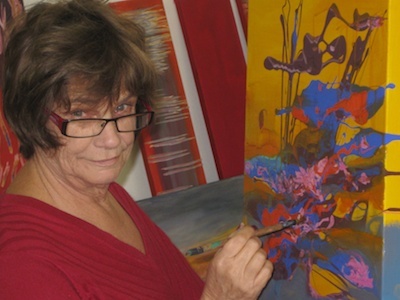 Her next major exhibition is in Margaret River during Easter 2010. 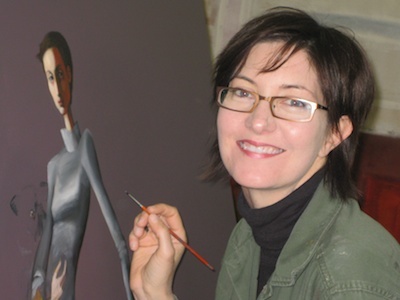 She recently won a category of the Cossack Art Prize 2009. 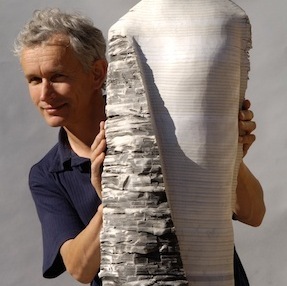 Graham Hay 's sculptures were selected for the Albany Paperartzi, Cottesloe's Sculpture by the Sea, and Rockingham's Castaways Exhibitions. With local artists, Graham built and ignited a suspended paper kiln on Falcon beach. Two trips to the US followed, one was a sell out workshop for the US Potters Council. En route Graham gave sell out workshops in Queensland and Sydney, one for the National Australian Ceramic Association. 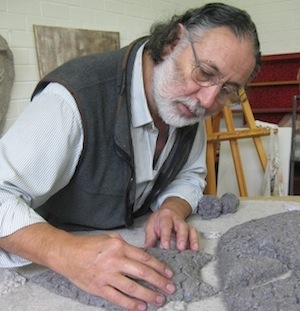 In 2010 he will co-lead the first US based International Paperclay Symposium (and second US Paperclay Conference), and give further workshops in Queensland. His studio based community classes continue to be popular with waiting lists now for some classes. Frances Dennis spent 2 months on the motorbike early this year, across the Nullarbor, around Tasmania, up the coast and finishing in Brisbane before returning home in April. A total of 15,000 kilometres. She has been renovating her house since then and so apart from studio administrative duties has been creating her penultimate resting place rather then works of art on canvas and in clay. Umberto Alfaro has been seen at the Studio more often than usually, due to the preparation of his next solo exhibition âPULPitations VIâ on the 4th of December 2009 at Atwell Gallery â in Canning Highway, Alfred Cove. This is going to be Umberto's last PULPITATIONS before his long trip to Chile ( a year or so ) in April 2010, so, PULPitations VI is a MUST to see, don't miss it. Ren Edward is currently sketching compositions for her future solo exhibition. She is working as a Graphic Designer for a number of fantastic studios in Perth. As well, she has taken on a role as a educator for a new Yoga Apparel brand to Perth! As she is totally addicted to Bikram Yoga. Fran, Graham & his students continue to benefit from the use of the small kiln lent to the the studio by Trisha Crabtree. A very special thanks must go to Wednesday afternoon student Cherie Trouchet who donated her aunt's kiln to the studio. Thanks also to Augusta IGA store Manager, Craig and Helen Robins, for organising transport to Perth, VMG for unloading it at the studio, and Keith from the Town of Vincent for organising the ventilation and 3 phase wiring quotes. As a thank you to the above and to celebrate the new kiln, a Pizza and Champagne night was held. It was a great success, with compliments and requests for a repeat still coming in a month later! About 30-40 people came along and enjoyed the opportunity to meet studio artists and fellow students from other classes. Many commented on how great it was to meet like minded people, and to eat pizza that was perfectly cooked. This was pretty amazing given that the longest they were in the new large kiln (the reason for the party) was 4 minutes! A special thanks also to Saturday student Jacki Soutar who donated a dishwasher to the studio, and the Town of Vincent for organising it's correct installation. This upgrade to the facilities has freed up more valuable creative making time. We wish you a very Merry Christmas and a highly creative New Year! This newsletter is to keep you informed about the Robertson Park Artists Studio. If you want to receive it in future, click below on JOIN NOW below. Because of a widening circle of artists and students, our apologies if we have missed anyone or event.